Google Analytics is the top player when it comes to tracking website visitors, no one argues with that. The value of the platform is reflected in its popularity, which is why it’s the market leader boasting an 83% share. That’s a strong argument. However, this prominence might result to some extent from overall trends and following statistics, not just from the tool’s functionality. Even though some consider Google Analytics the standard, there are reasons to ask if it’s really the perfect choice for your marketing setup. It’s crucial to get a grasp of issues which might be out of view if you focus solely on one tool. If your organization handles data on a daily basis, you should know there are some other analytics platforms offering extensive functionality. In this post we’d like to share some reasons why you might consider Google Analytics alternatives. A lot has been said already about cloud deployment of web analytics tools, because it seems to be the most convenient method. Why is that? It’s popular for a few simple reasons: because it’s free, it cuts maintenance costs, offers ease of scalability, and doesn’t require the purchase of additional infrastructure. Google Analytics is said to be free, but don’t be misled: the hidden costs are to be found somewhere else. In the case of GA, a cloud-hosted option, it might be the cost of data security and compliance. As the devil is in the details, the issue lies in Google’s Terms of Service, which you should carefully examine to know how your data is acquired and used. Besides that, the data you collect could be sent to a remote server at an unknown location. In other words, you don’t know where the data is stored and processed. What’s more, it could be leaked to third parties, particularly advertisers. Moreover, when you’re getting ready to choose a web analytics vendor, take a closer look at the details of the policy and agreement to make sure that self-hosted web analytics goes hand-in-hand with full control over your data. That said, the cloud option can also meet these requirements. One example is Piwik PRO. Bear in mind that if your company is one of those operating in multiple countries, you need to be aware of numerous challenges resulting from the requirements of both local data privacy laws and international regulations. If you collect and process data from residents of one of the countries of the European Union, it is strongly advisable to have data stored on servers located there. In the case of China and Russia, two countries with the most rigid data processing regulations, you must have your own data center in each of them. The same rule applies to some particular countries of the European Union, like Germany. Non-compliance with such requirements puts your business at risk of heavy fines. In practice, it means sharing your data with third parties. What’s more, a violation of the ToS can result in termination of your account and the loss of all your data. This is definitely not the scenario you want to play out. Having full control over your data and its storage is a tricky matter considering the growing demand for privacy-friendly services. It’s even more complicated because of constantly-changing data protection legislation around the globe. The upcoming GDPR regulation, which adds even more weight to the issue, is turning it into a real legal compliance nightmare. Consider a web analytics tool which enables you to store the software and all of your data on your own infrastructure, so you have complete ownership over your data. With the right tool you can gather and store PII together with other sensitive data. These possibilities are provided by the tools etracker Analytics and Piwik PRO. This way, you are in charge of who can obtain access to such information. No matter how advanced the technology is, all software has its limits. When you select tools for your marketing arsenal you need to minimize the impact of restrictions on your organisation. This is where Google Analytics’ downsides come into view. Firstly, there’s a data limit of 10 million hits per month. For a site with high traffic volumes, it’s a significant obstacle. It also means that there’s no guarantee your results will be accurate. Consequently, it causes issues with obtaining reliable metric analyses. Further limits apply to the number of properties, goals and transactions you can track. unlimited data storage and export. You can’t get these capabilities with Google Analytics, but other vendors like Webtrends, Adobe Analytics, etracker Analytics and Piwik PRO make it possible. The more flexibility the tool provides, the easier it is to analyze the results. It’s worth considering software that lets you freely track as many actions, events, and properties you want. In this way you get deep insights that let you reach your particular goals. Your business strategy relies heavily on the data your acquire, so it’s crucial to get access to a full set of data, not just samples. In the case of Google Analytics there’s a risk that if you exceed the limit of 10 million hits in a month then your data will be sampled. What it means for your reports is that they can be misleading, as they’re based only on certain data sets. The truth is that if you have high traffic on your site, then you can easily reach such a threshold. Of course, you could upgrade to GA 360, but that comes with hefty price tag. Still, there’s another way for your reporting to be as precise as you need. 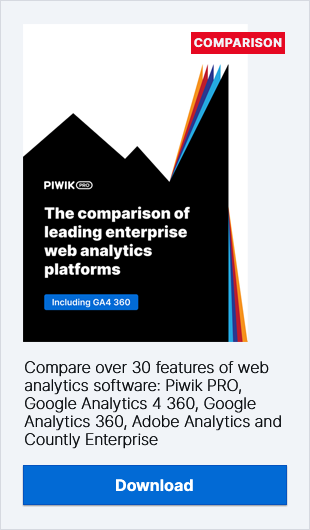 Opt for Google Analytics alternatives, like Webtrends and Clicky, or alternative as Piwik PRO, which provide you with unsampled data to help you to make better data-driven decisions. What’s more, Piwik PRO offers you this option no matter what pricing plan you decide to sign up for. As you want to know what’s going on your site at one glance, generating reports based on real-time data is an absolute must. This is a matter of operational efficiency and informed decision making. Unfortunately, you can’t access instant data with Google Analytics, because it lags at least an hour. In this case it might be advisable to go for web analytics software that shows you the most current conditions, so you can devise a strategy based on real-time information. There are vendors that offer such capabilities, such as Clicky, Woopra, and Mixpanel, just to name a few. Besides that, if you decide to go for GA alternatives you could get other valuable features. For instance, with Clicky you can obtain useful options like real-time heat maps for each individual user, or Twitter monitoring. Another alternative, Wooper, extends these real-time functionalities and provides automatic segments updating plus up-to-the-minute notification.